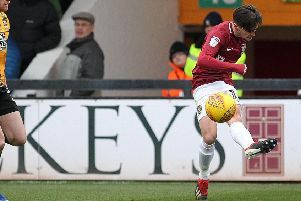 Striker Kevin van Veen is a doubt for the Cobblers’ must-win Sky Bet League One clash with Plymouth Argyle at Sixfields on Saturday. Van Veen was taken off after only 30 minutes of last weekend’s 3-2 win at Bury after suffering a dead-leg, and his injury has yet to be properly assessed as he has yet to report for training this week after being struck down by an illness bug. Fellow front man Kevin Luckassen definitely misses out of the clash with the Pilgrims due to his thigh injury, but Matt Crooks is in contention for a return to the starting line-up after fully shaking off the hamstring strain that saw him miss last week’s defeat at Blackpool and only take a place on the bench at Gigg Lane. “I don’t know how Kevin is at the minute as I haven’t seen him, he has been ill,” said Cobblers caretaker boss Dean Austin when asked about van Veen’s fitness on Tuesday afternoon. The Cobblers are due back in training on Thursday, and Austin will be hoping the former Scunthporpe United front man will return fit and well, but his countryman Luckassen will not be involved against Plymouth. That includes Crooks, with Austin adding: “Crooksy has been struggling with his hamstring following the Peterborough game,. “He wasn’t fit for last Tuesday, and only trained a bit on the Thursday and the Friday, so that is why he was only on the bench on Saturday. Meanwhile, central defender Aaron Pierre is also back in full training after his thigh injury, but he too has been hit by illness and didn’t train on Tuesday, while fellow long-term absentee Aaron Phillips is still going through his recovery. Austin and the Cobblers players will be keeping a very close eye on the Tuesday night fixture between Rochdale and Oldham Athletic at Spotland (ko 7.45pm). As it stands, Oldham are fifth bottom in league one, three points better off than the Cobblers, while Rochdale are fourth bottom, with two more points that Town. Both teams also have two games in hand on Austin’s men, who only have three fixtures remaining this season.